EXCLUSIVE! 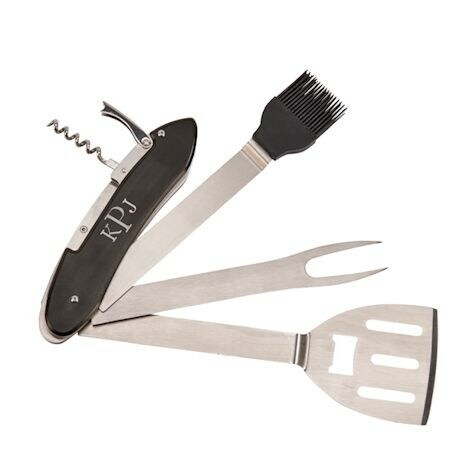 This compact grilling tool opens into into two grilling essentials. 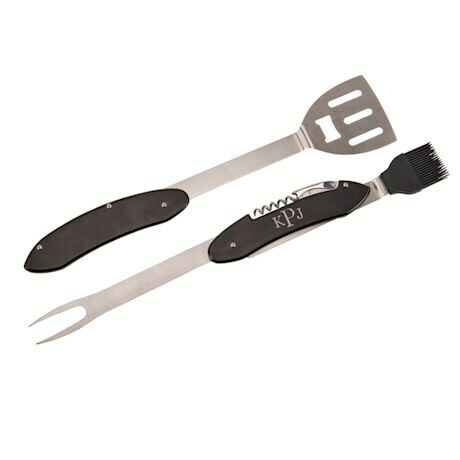 The handle separates to create a 17" long spatula and a long fork with a basting brush. Includes corkscrew and bottle opener. Comes in a black gift box. Handle can be personalized with a 3 initial monogram - Please enter your initials in this order 1) First Name Initial (Kristin) 2) Middle Name Initial (Jane) 3) Last Name Initial (Peterson) - The Last Name Initial will be in the center, in the traditional style. Also, if this is for a couple you may choose to do 1) First Person's Initial (Kristin) 2) Second Person's Initial (Jason) 3) Surname of Couple (Peterson) - The Surname Initial will be in the center, in the traditional style Tools are stainless steel.